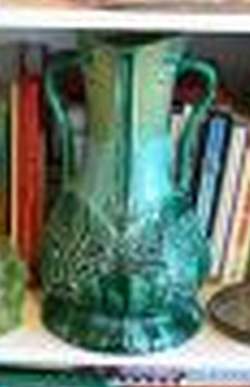 Raised mark looks like all green vase or lighthouse or tower or a flower and stem:- This item was purchased at an estate auction in Northern Kentucky this past year. I know nothing about it. It has AUSTRIA marked on it and has this sort of a flower on a stem kind of image that is raised. 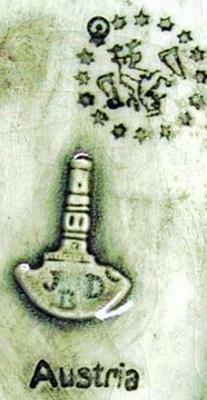 There is also a mark of the numbers 7 18 imprinted on it. It is the tall green vase in the photo. This mark has been identified as that of Julius Dressler. Other site visitors have sent in additional photos which make the mark much easier to see in detail. On close inspection it looks like a building - a lighthouse almost, but this would be incongruous for a non-maritime region like Bohemia (Austria). You can see clearly the right way up from the close up photo above - there appears to be windows and other indications of a tower, but why the irregular shape at the bottom? Dressler established the unit in 1888 in Bela or Biela Bohemia. This town used to be in Austria, but changed to Czechoslovakia after the wars of the 20th Century. The factory was producing majolica (fancy hand painted earthenware) and also porcelains. They continued until the middle of the 20th Century. The changes to borders and empires after the WW2 seemed to put pay to this factory. However, Ginni goes onto explain that this was an association of makers formed by the new Czechoslovakian government.